Na Nach Nachma Nachman Meuman: Peace BEFORE Sept 15th? The root cause of this WAR is in Uman, Ukraine. Rabbi Nachman was not only a faithful subject of Paul I and Alexander I two Russian Tzars MURDERED by the Kremlin in order to keep Russia and Ukraine enslaved, he was also the second son Rachel cried for after she refused Benjamin who was not on a higher level than Josef. Israel was in Egypt as a result of selling Josef. Freedom could only come by taking Josef out of Egypt for burial in Israel. Moses did that, but he didn't ask Pharaoh for Josef he asked for a three day celebration...maybe it would have been wiser to let Ahron speak. Moses asked 600 000 Hebrew slaves for help taking Josef out...no one accepted...this is very strange, but proof that nothing had changed yet. The reason we could leave Egypt is not the cry, as G-d told Moses, but rather the fact that Pharaoh forgot Josef. Had G-d told Moses tell Pharaoh to give us Josef, that would have brought the redemption, but the nation of Israel would never have reached maturity. I believe we all want Rabbi Nachman here today except for those that take Kremlin money (you understand). Putin is NOT allowing Rabbi Nachman to be buried in Israel, certainly not Jerusalem. What does he care? He cares very much, because he is SECULAR like the slave promoting Kremlin. "There is NO G-D, man was created to serve superior men!" Of course this is false, "all men were created equal" before one G-d who loves all his children, priests (who do not have property) and non-priests. If you want to prevent the killing of 150 Ukrainians per day and avoid a biological War that can wipe out 50% of humans. 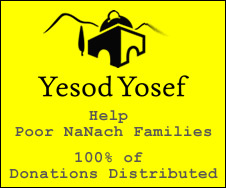 Pass the message that Jerusalem will accept Rabbi Nachman and provide an annual revenue of a Billion USD equivalent in Shekels of Dollars to Ukraine. There could also be joint defense with the Kingdom of Saudi Arabia and the IDF if peace isn't immediate (which it will be).